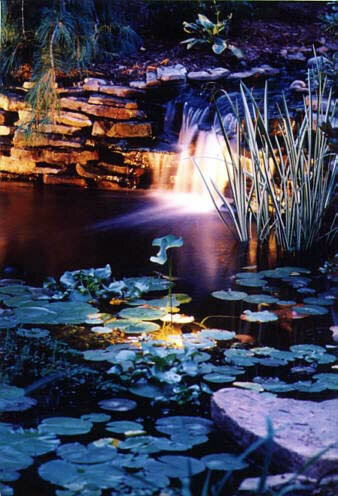 Lighting can enhance the beauty of your pond. Lights can be installed above or underwater. Lighting from above the water looks better in our opinion because it does not highlight the organic particles in the water. The water can appear much clearer this way. LED lights are very popular today and use less energy. They also last a lot longer. Whether lights are in the water or in the trees we have the artistic eye to set your mind at ease.